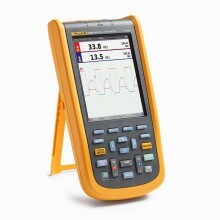 Fluke gives you more diagnostic powers with the Fluke 190-202 Scopemeter. 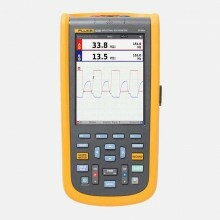 This dual-input 200MHz scopemeter is rated up to CAT IV 600V, this unit meets the the requirements of the most demanding applications, with independent isolated inputs that allow for low and high voltage measurements without the risk of accidental short circuits. Number of channels: 2. 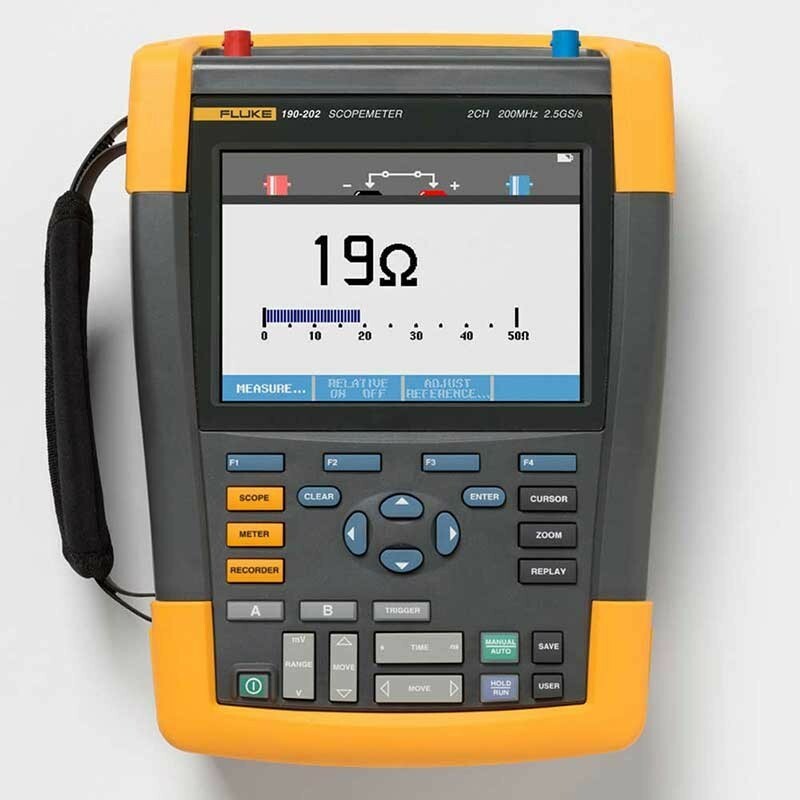 The 190 Series II is the one test tool you will reach for to tackle just about any troubleshooting task. 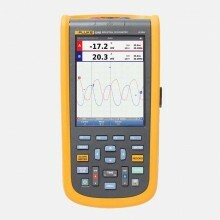 They include a multimeter, TrendPlot™ and ScopeRecord™ roll paperless recorder modes and hands free operation with Connect-and-View™ triggering, and much more. Dedicated 5000 Count digital multimeter. Number of channels 200 MHz: 2 channels. Real-time sample rate 2.5 GS/s. 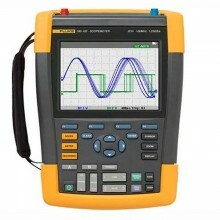 Inputs 2 scope plus DMM input. Timebase range 2 ns - 2 min/div. 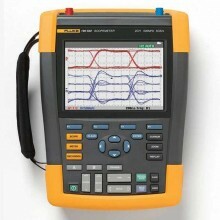 Trigger types Connect-and-View™, Free Run, Single Shot, Edge, Delay, Dual Slope, Video, Video Line, Selectable pulse width, N-Cycle. 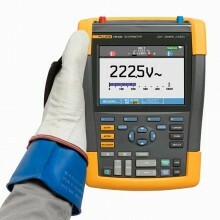 Trigger source Any scope input channel, or external via DMM input. Meter inputs (also used as External Trigger Input for the Oscilloscope Mode) 4 mm banana inputs, fully isolated from scope inputs and from scope ground. Measurements VDC, VAC rms, VAC + DC rms, Resistance, Continuity, Diode Test, Current (through clamp or shunt), Temperature °C or °F (using optional converter). 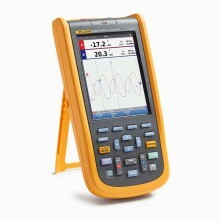 Display 153 mm full color LCD with fast update rate. 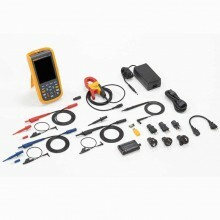 Operating temperature 0°C to 40°C Including Batteries. 0°C to 50°C Excluding Batteries. 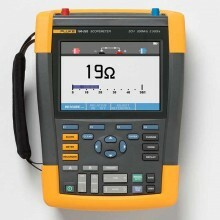 Electrical safety 1,000 V CAT III/600V CAT IV (EN61010-1). 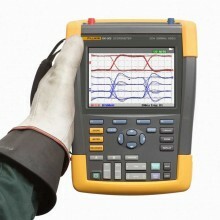 Warranty 3-years on main instrument, 1-year on accessories. 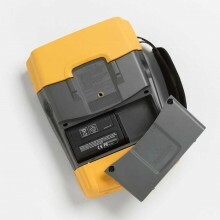 Li-Ion battery BP290 2400 mAh battery up to 4 Hours included standard.